Today we are thrilled to launch a brand-new website for the college at www.trincoll.edu. This project is the culmination of nearly a year of collaborative and strategic work between the Office of Communications and Information Services, together with our interactive agency, Fastspot, and our broad campus advisory group. The website is the digital front door of the college, and while there have been some design and functionality updates to the website over the years, this is the site’s first fundamental overhaul since 2011. We have completely reengineered the site to create a new design, content strategy, and an information experience that prioritizes storytelling and strategic wayfinding. Mobile-first experience: Not only did we set out to create a mobile-friendly website, but we understood that some of our users may only ever experience the website on a mobile device. All of the content is right-sized for mobile devices without losing critical information. Easier-to-read and more accessible to all users: We know that the previous website wasn’t always easy to read. We heard from users that the small, low-contrast fonts made the previous site difficult to read. This design employs larger, modern fonts and high-contrast readability. In building the site, accessibility for all users was a high priority, and we built the site to conform to The World Wide Web Consortium’s (W3C) Web Content Accessibility Guidelines (WCAG) 2.0 level AA standards. This means that we have used a stable, referenceable technical standard for building the website, and we will continue to test for and improve the site’s accessibility using these guiding principles. If we have missed the mark, though, we want to know about it so we can make it right. Relatable content that allows more voices from our community to be heard: From the moment you land on the homepage, you’ll find stories about students, alumni, faculty, and the places and pride moments that make us who we are as a community. A brand-new public events calendar: With the launch of the site comes the launch of https://events.trincoll.edu. Here you’ll find events from the new calendar feeding into the website’s homepage, and as more events when the academic year gets underway, we’ll add more targeted feeds throughout the website. This is a phased launch. Not all sites have moved over to the new design. As we outlined early on, many sections of the website are still in the SharePoint CMS. This allows the Office of Communications to work closely with site owners to shape their content to be as successful as possible in the new design. While users will encounter sites in SharePoint quite quickly once they leave the site’s homepage, we have worked to ensure that the information experience is seamless. If you spot any places where it isn’t, please let us know. Site search is improving. We are using Google Custom Search Engine (CSE) as the site’s search engine. While this is a powerful tool for site search, you may see ads come at the top of your search results. This is not ideal and was not our intention. We are working with Google to change our CSE to be ad-free. Additionally, as Google crawls and indexes our new site, you will see your search results continue to improve. The full crawl should take a few weeks. We need your help. As you navigate through the site, we want to hear from you if you have trouble using the site, spot errors, or have any feedback for us on how we can improve the site. Please be in touch and we’ll work to make it right. Today’s launch is the beginning. More sites are already in the process of migrating to the new design, and we’ll be working with site owners throughout the year to migrate their content into the new site, train users on how to manage their new WordPress sites, and help event managers learn how to use the new events calendar. It’s been about nine months since we began the process of redesigning the college’s website. On Tuesday, August 28, if our testing and results continue as planned, the new website will go live. We hope you will encounter no flaws as you are looking for information on the site, but if you do, you can contact us. We want to know about any problems or questions. As we outlined earlier in the project, we are embarking on a phased approach to migrating content into the new website. This is a strategic decision to give our team the ability to work with site owners to address each site using care and attention to create successful content. The college’s homepage and a targeted list of sites and pages (see below) will be in the new design. Content not yet migrated into the new site will remain in SharePoint as we work with site owners to move it into WordPress during the coming academic year. A note for content editors: This does not mean content editors will be responsible for maintaining two sites. Either a site will be in WordPress or it will be in SharePoint, but not both. Training for site editing and maintenance will be part of the process to import content into WordPress. It is the intent for users to move seamlessly between the two sites—it will all behave as one trincoll.edu. However, there will be an obvious difference in design depending on whether they are looking at content in the new site or in SharePoint. As content is migrated from SharePoint into WordPress, we will reduce the instances of users seeing two different designs. We have added significant amounts of new content that didn’t previously exist, including a searchable academic programs menu and stories about people, places, and pride—all available on the homepage—and a Career and Student Success landing page. Questions, Concerns, Problems: Email Us! We understand that a new website is a big change. It will take time to get to know the new design and navigation environment. If you have any questions about the launch, your site’s content, things you’re experiencing when you use the new website, or if you encounter problems with the site (bugs, broken links, photo or text issues…anything, really!) please let us know! Email us, because we want to hear from you. We want to know about your experience, and we want to improve anything that isn’t working. It’s the middle of the summer, but the work of redesigning Trinity’s website marches on. Our project team has hit several milestones since the spring, and we have a few more coming up. In this post we will update you on what we’ve accomplished, what we’re doing right now, and when we will launch the new site. The site’s design is complete. The coding to build the site is complete (front-end development). We have a content strategy document that guides us in creating successful content. We have a document that outlines how everything on the site is supposed to behave. The WordPress CMS is built and our project team is adding content. When we last reported on the design templates for the site, we had arrived at a second version and chosen a design direction. Thanks to the incredible response from the Trinity community, we have been able to incorporate smart feedback from a variety of perspectives into what is now the final design system for the college’s site. This means all the designs for the pages in the site are complete. Click on any of the template images to view them larger in a new tab. All words and photos are for placement only (FPO) and do not represent final choices. The coding team at Fastspot has finished their development work. This means the WordPress editing environment is done and all the components that collectively form the design and behavior of the site are fully built. The content strategy document contains guidance on voice and tone usage throughout the site, and it outlines the optimal use for each page template and component used in the site. The principles and the document will be given to site editors during WordPress training in order to help them be as successful as possible with their new sites. A functional requirements document is a tool for the project team to name and define all the components in the site and how they are supposed to behave. Components are the individual items that are used to build a page template, and a template is a collection of components arranged in a particular layout and order. Not only does this document help our team keep track of all the parts, but portions of this document will help site editors understand how to choose the right components that will help them achieve their goals with their websites. This week our project team was given the proverbial keys to the WordPress CMS for the college’s site, and we are actively populating the site with the content we have identified for launch. The site is currently residing on Fastspot’s development server until it is completed and handed over to Trinity for launch. As our project team populates the site with content, the Fastspot team is working through quality assurance (QA) testing. This means they are combing through the site to identify and resolve bugs that affect functionality for both the site user and the editors using WordPress. Over the course of the next five weeks, our project team will be building content in the site, including migrating the sites we have identified for launch. We remain in touch with departments and site owners throughout this process. Of course if you have questions, you can feel free to be in touch. Trinity’s new website will launch early during the week of August 27. This is an exciting moment for our entire community, but we understand that you may have questions. When will my site be migrated into the new site? When will I receive training on how to edit in the new website? What do I do if I discover a problem with the new site? What if I can’t find what I’m looking for? First, in the next week or so we will have a post that details the site’s launch plan. Second, if you have questions, please ask! We’re here to help you know as much as possible about the website. In March we asked for your help in choosing a design direction for Trinity’s new website. In this entry we recap what we heard from the Trinity community, we share which design direction we chose, and we again ask for your input into the design. More than 70 people from across the Trinity community took the time to consider the two design concepts, and they sent us their incredibly thoughtful feedback about what they saw and experienced. Respondents included faculty, staff, students, alumni, and a few unknown folks. Colors seem to have little to do with Trinity. Can there be more use of blue and gold? What about Design Concept Two? Some of the distinguishing feedback about Design Concept Two included opinions that the design was bold, vibrant, fresh, and easy to navigate. Some respondents liked that Programs was prioritized over People, Places, and Pride. However, the standout negative comments included a dislike for the “dead space” at the top of the page, the amount of scrolling to get to content, and the use of the blended grid showcasing the feature content (People, Places, Pride). The Result: What Did We Choose? Let’s cut to the chase: We chose Design Concept One. We arrived at this decision using the feedback from the community at-large, the feedback from the Web Redesign Advisory Group, and the feedback from the Website Redesign Team. Choosing a direction represents a starting point for the design. We were at a fork in the road, and now we have chosen a path. Fastspot has taken our feedback and is using it to build out the design into something that truly fits Trinity. During the design process, there are three rounds. The second round incorporates the comprehensive feedback from the community, the Web Redesign Advisory Group, and the Website Redesign Team. The third and final version (still to come), will be our final design. Below is an explanation of the second iteration, and sample images for you to explore. Click on (or tap) any image to open it in a new tab. Click (on desktop) the new image to move in closer and see a full-screen view. The images are static and are for reference; they do not allow interaction. In this second round, Fastspot has simplified the use of color throughout the entire design to focus more on the Trinity brand and create a more sophisticated look overall. The secondary color palette (the greens, yellows, blues, etc.) is used in smaller details, such as live hovers and swiping animations. We recognized that the background video can be either highly attractive or a powerful deterrent to visitors. To solve this issue, Fastspot added the ability to play/pause the atmospheric video. It is a subtle addition, and it will be beneficial to accessibility without adding too much clutter to the page. Click (or tap) to see a larger version. Click (on desktop) the new image to see full-screen. A new feature to the homepage’s functionality is that we changed how the feature topics (Programs, People, Places, Pride) bump out when selected. In the previous version, they took over the screen, creating a new layer over the homepage. In this version, we requested that they remain on the same layer as the rest of the homepage. In the image below, you can see an example of this. Programs has been selected, and the feature has appeared below the menu and pushed the rest of the homepage down. Users can either mouse-over to the other three menu items (and have the corresponding feature appear), or X-out to make the entire experience accordion closed. Though we didn’t show the mobile version in the first round of design concepts, here is a look at the mobile version of the design. When feature topics (Programs, People, Places, Pride, etc.) are open, they behave as takeovers. This allows users to control their experience within such limited real estate. Click (or tap) to see a full-length view of the mobile design. Click (on desktop) the new image to see and scroll full-screen. What do you think of this iteration of the design? Feel free to share your thoughts in the comment form below. We will conclude feedback this week (April 13). One of the most exciting moments during a website redesign project is when design concepts are unveiled. For the first time, high-level concepts, abstract thinking, and text documents come to life in a way that everyone can instantly relate to. A motion comp for each of the two designs (a video that shows how each design looks and its behavior) with high-level concepts about each design. We want you to see how the design looks and how it behaves for users. A request for your help. We want to hear your feedback on these designs. This design creates an immersive takeover to connect people to the right type of content they’re looking to find. It features a full-screen experience with background atmospheric video (photos can also be swapped in). The Programs, People, Places, and Pride menus (known as the progressive navigation in our information architecture) are the main storytelling devices on the homepage, and the content that’s progressively revealed in each of these sections allows for a wide variety of metadata to accompany each feature before users can decide to click over to the full section or story. Within the Programs section, a search and filter function allows users to filter by program category (which will change the results on the right side of the page) or to search for a particular program. The navigation uses a mobile-first approach with the use of the “hamburger” menu in the top right corner, and it contains the traditional site architecture menu as well as the search function. Additional topics and audience navigation can be found in the footer of the homepage. The calls-to-action are housed in a sticky navigation at the top of the page (and throughout the entire site). There is a seasonal Important Things to Remember section that will showcase stories most relevant to a particular time of year. All photos, videos, and text within this concept are for placement only (FPO), and do not represent final decisions on photography, video choices, or approved copy. This design has some notable differences from the first design concept. The images at the top of the homepage are are triggered to change using mouse over in the left area of the screen. This is designed to be more playful, rather than using the traditional model of random or looping image rotations. The Programs, People, Places, and Pride menus move from equal weight to prioritizing Programs with a large call out that bumps open to reveal the entire list of academic programs. People, Place, and Pride are placed in a blended grid (which can be filtered and resorted by choosing any one of the three). Like in the first design, content within Programs, People, Places, and Pride is progressively revealed before users can make a choice to go to the full story or section of the site. Like the first design, the navigation uses a mobile-first approach with the use of the “hamburger” menu in the top right corner, and it contains the traditional site architecture menu as well as the search function. Additional topics and audience navigation can be found in the footer of the homepage. The calls-to-action are housed in a sticky navigation at the top of the page (and throughout the entire site). This design also contains a Things to Remember section, but the design is treated differently than in the first concept. Characteristics are a set of guiding attributes and values to which creative decisions can be held. Look and feel characteristics speak to the aesthetics of the site as they relate to design, images, and the overall visual impression of each page. Voice and tone characteristics relate more to the writing, content strategy, and information architecture (IA); however, words and ideas from both lists can speak to the project as a whole. Broadly speaking, we want the homepage and primary landing page experiences to be focused on prospective students, while providing easily-reached, dedicated spaces for secondary and tertiary audiences. The website should be as user-focused as possible by serving each audience along anticipated paths. While some sections apply more to a particular group of users, there are other pages within the site that serve multiple audiences at once. Prioritization will aid in decision making, especially as it pertains to content hierarchy and information architecture. We understand that members of the Trinity community have strong feelings about the best possible way to represent Trinity on the web. These two design concepts represent the first step in choosing a design direction for the site. Our goal is to choose a direction and build out one of the concepts so that it represents a complete and informed design solution for the homepage and all parts of the site. Which design concept do you gravitate to the most? What do think are the three strongest things about Design Concept One? What do you think are the three strongest things about Design Concept Two? Do you feel like the design concepts are addressing their primary look/feel and voice/tone keywords? Do you see specific things in either concept that don’t live up to the guiding principles of the project? Think about what and why: Be specific about what part(s) of a concept you do/do not like and why you do/do not like it. Let us know your thoughts using the form below! Information architecture (IA) is the organizational and navigational structure of the new website including categorization, hierarchy, labeling, and way finding recommendations. It also begins the thought process that will evolve into the full functional requirements. Specifying the IA for the site, beginning with the high level, and then down to levels two and three, is the next step in the process before we move to design and building out the site. Having an IA in place, even if it’s only being managed in a spreadsheet, gives us the context for how to find a design solution and how to build out our content plan. It includes a more radical, horizontal, progressive way to get to information, using a distinct home page navigation structure that breaks with existing conventions. This progressive navigation is evergreen, reachable from every page, and always visible. The radical navigation is meant to have more emphasis than the traditional navigation, but both will be prominent. As more content and areas of the website are re-written and organized post-launch, it provides a way to add more items from the traditional to the home page model. The Website Redesign Advisory Group has spent time considering the IA and discussing how to organize the information, what language we’re using in the IA, and how website analytics data helps us make smart decisions about prioritizing what our audiences are looking for. Have a look at the final IA list down to level three (which is of course not set in stone, but final enough to allow us to move to the next step in the project). Our group’s biggest action item for January was to finalize a list of content that will launch with the new website. When Trinity’s new website goes live in August 2018, a large amount of content from the current version of the website (SharePoint) will be brought into the new site (WordPress), but not all of it can come at once. The job of addressing content to ensure its accuracy, relevance, and ability to fit into new design templates before August is too much to do all at once. Therefore, we’re pursuing a strategy that will bring over content in phases. A phased approach to launching content means that in practice we will be running two sites (new and old, WordPress and SharePoint) simultaneously. The two sites will be stitched together, which users will navigate as a single domain (www.trincoll.edu). Of course, users will experience differences in design depending on where they are in the site. For example, a user may set off on an information pathway from the homepage, and as they move around they may follow a link to an administrative office’s site that hasn’t been brought into WordPress. The user will land in the old design (SharePoint). Moving back and forth between WordPress and SharePoint will be seamless, save for the differences in design. Functionally it will be a seamless experience. The content slated for phase one was determined based on the goal of creating a cohesive information experience for our primary audience (prospective students) and supporting information critical for daily operations. This means that the entire content of these sites will be brought into the new site. It does not mean that sites still in SharePoint will be rendered invisible. Collectively we have an opportunity to create a look, feel, and narrative that shows the best version of Trinity. To achieve this goal, we will adopt an 80/80 focus. At launch, the site will provide the majority (80%) of the content relevant to the majority (80%) of users’ needs as intuitively and as seamlessly as possible from the homepage. To reiterate: Content (entire sites) slated for phase-one launch will undergo a comprehensive review and editing process in order to optimize them for the new website. This content production process will be done in close partnership with site owners. Phases two and three of content migration are targeted for roughly the end of each semester during 2018–19 academic year. While we have made a rough list of content that will migrate in each phase, the reality is that scheduling is contingent on each site owner’s schedule and capacity to dedicate time to partnering with the Communications Office on addressing their content and migrating it into the new WordPress site. We will be working with site owners to determine these schedules. Starting with the website’s new homepage, we are building a powerful and innovative tool to help users find information they want. Our charge is to give users the ability to see both the breadth of Trinity’s programs and personalities and depth of any specific area. This means surfacing information and telling stories that traditionally have existed deep in the vertical information structures of our website (a typical higher ed. website approach). If a section of the site isn’t on the list for phase-one launch, it doesn’t mean it will lose visibility or it will miss out on the advantages that come with an exciting new website. Rather, we will be creating new landing spaces and transitional experiences that will improve users’ ability to find sites, programs, offices, and departments, regardless of whether they are in WordPress or waiting to move out of SharePoint. Our content-first approach to this project means that we are thinking hard about how to design a site that will prioritize what users want to know, not how we see ourselves in an org. chart. 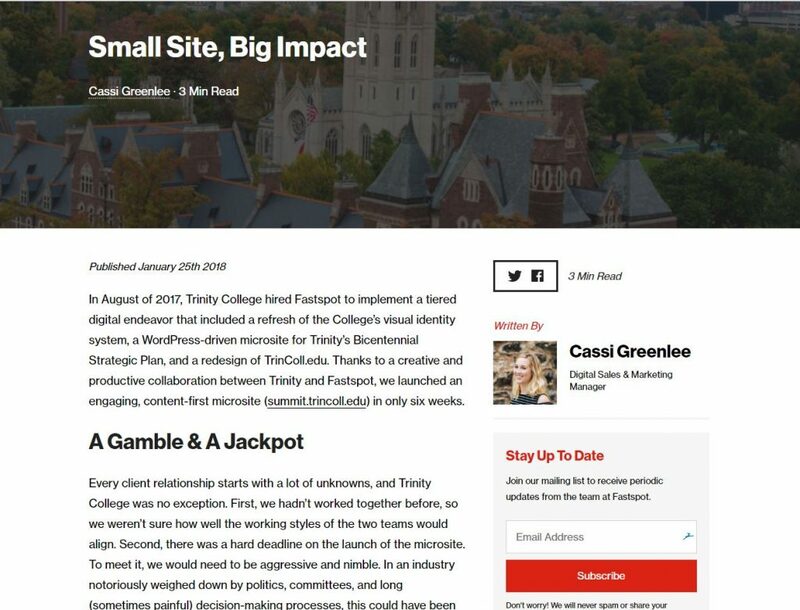 Fastspot recently published a blog post that chronicles the partnership between Trinity and their team on creating the Summit microsite. This deep dive into the project illustrates the working relationship we have with Fastspot and the methods we are using as we collaborate on the website redesign. The timeline and number of people involved, however, is much different for this project. Read the post over on their site. A content prioritization plan that outlines which content will launch when the site goes live in August, and which content will launch in the second and third release phases. How do you know when it’s time to redesign the college’s website? In Trinity’s case, the need has become apparent over the last several years. The site’s last major redevelopment was in 2011, and in the more than six years since that work was completed, Trinity has evolved in many ways, including the arrival of new leadership and the adoption of a new strategic vision. Additionally, technology and expectations move at a lighting pace, and it’s clear that the site’s front-end user experience no longer serves users in the best possible way. Redeveloping the college’s website is a huge undertaking. While some institutions choose to do the work in-house, we knew that in order to be as successful as possible, we would need to bring in a strategic partner who could conceive of, design, and develop a new institutional web presence that meets our technical and functional needs while delivering a contemporary and visually stunning experience with a content strategy that captures the vibrancy and exciting evolution of Trinity College. In July 2017 we put out a request for proposals inviting several interactive agencies to submit proposals for the work. The agencies ranged in size and geographic region, and they all were capable and respected firms. Fastspot stood out to our team as a clear favorite. Their deeply collaborative style melds strategy, design, and development into a fluid and iterative process that felt like a perfect fit for the project’s core web team. Not only did we feel that their process was the right fit, but their appreciation for Trinity’s distinctiveness as a liberal arts college in a diverse capital city was apparent. It was clear to us that they got who we are and they were going to make our story come to life. By August, we were officially partnered with Fastspot and beginning the work of creating the Summit strategic plan microsite and refreshed visual identity. Since 2001, Fastspot has been partnering with clients in the education, arts and culture, nonprofit, and professional services industries.Our day-to-day team members meld project management, UX, and design into a cohesive process that will lead us through development and launch. Fastspot is Trinity’s partner from start to finish. materials review, on- and off-site research, content audit, etc. Front-end development, WordPress integration, etc. Basic functionality, design review, UX reviews, usability testing, etc.